The other day, my husband and I were taking a walk, discussing what to make for an upcoming pizza night (a weekly tradition in our home,) when we passed by a Mexican restaurant with outdoor seating. Catching a glimpse of the delicious food being served, I thought: why not make pizza with Mexican flavors? 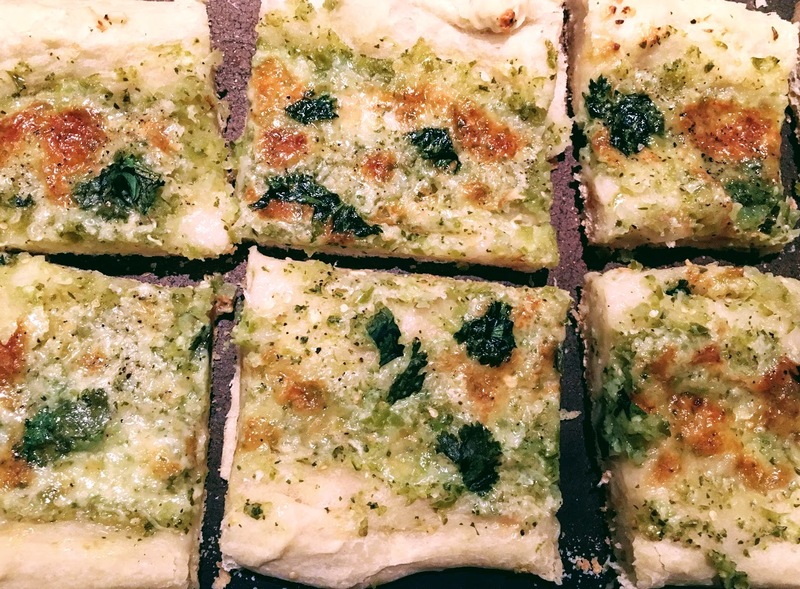 I wanted something simple and subtle, not overloaded with toppings, so I prepared my light, fluffy pizza crust and topped it with homemade salsa verde, grated Monterey Jack cheese, and cilantro leaves. After removing the pizza from the oven, I garnished it with some avocado slices, which added a refreshing contrast to the jalapeno in the salsa verde. *If you would prefer a milder salsa, use half of the jalapeno. Note: Give yourself plenty of time to prepare the dough; for best results, it should rise for at least two hours before you bake the pizza. You can also prepare pizza dough the day before you plan to bake it and store it in the fridge overnight. Optional, but for best results: Place the dough in the fridge for another hour or two. Or prepare dough the day before you plan on baking the pizza, and let it sit in the fridge overnight in a covered bowl or in a gallon-sized plastic ziploc bag. A resting period in the fridge slows down yeast fermentation, allowing for a very long rising time, which gives the dough more flavor. 2. Prepare the salsa verde: Remove tomatillo husks. Roughly chop tomatillos, onion, and jalapeno, and place in the bowl of a food processor. Add cilantro leaves and salt to taste. Process until coarsely pureed. 3. Top the pizza: Preheat oven to 450 degrees F. Shape pizza dough into a large rectangle or circle (see this video for pointers), and place it on a baking stone or a lightly greased baking tray. Drizzle a little bit of olive oil over the crust, and coat entire crust using a pastry brush. Spread on salsa verde, leaving about a 1/2 to 1 inch border. Grate Monterrey Jack cheese, and sprinkle on top. Garnish with cilantro leaves. There may be some salsa verde leftover; store in the fridge and use to make another pizza or serve with enchiladas, tacos, or quesadillas. 4. Bake: Place the baking stone or tray in the oven, and bake for around 15 minutes, until the crust just begins to turn golden brown and reddish-brown spots appear on the cheese.